Nothing is more fun than watching your relatives, both young and old, trying to silently act out New Year’s themed phrases in a game of charades. Make your party fun for the whole family, and play a few classic party games that are appropriate for everyone! Some of the classic games like charades are always a hit, or you can choose to challenge everyone with a round of “Junk in the Trunk”. A game where the goal is to remove a ping pong ball from a kleenex box by shaking your hips. Playing party games will not only make your party fun and exciting, it will also get everyone laughing and create memories to last long into the new year. Photo booths at parties are a popular and fun way to make an event feel special. It is also the perfect way to have some fun with family and friends of all ages! To create your photo booth, simply choose an area of your home with a blank wall, or create a homemade backdrop like this one. Add an extra element of fun by providing fun props like hats, boas, and silly glasses for people to use. Print the photos on a wireless printer, or use a polaroid camera for an instant image. The photo booth will not only provide more entertainment, it will also allow your friends and family to take home a fun souvenir from the night. One of the simplest ways to please everyone, both young and old, is to provide a meal that is very casual. Instead of having a formal dinner, serve appetizers and pizza for everyone. The children will be happy because they won’t have to sit through a long meal, and the flexibility of having appetizers will make it easier for the adults to socialize. For drinks, offer both alcoholic and non-alcoholic options, but make the non-alcoholic seem special by mixing a punch, or offering sparkling juice. For the countdown, ensure that both adults and children have a drink for the toast. Having casual appetizers and many drink options will ensure your party is a success, and that everyone is happy with the selection. Realistically speaking, young children don’t usually make it to the traditional midnight countdown. 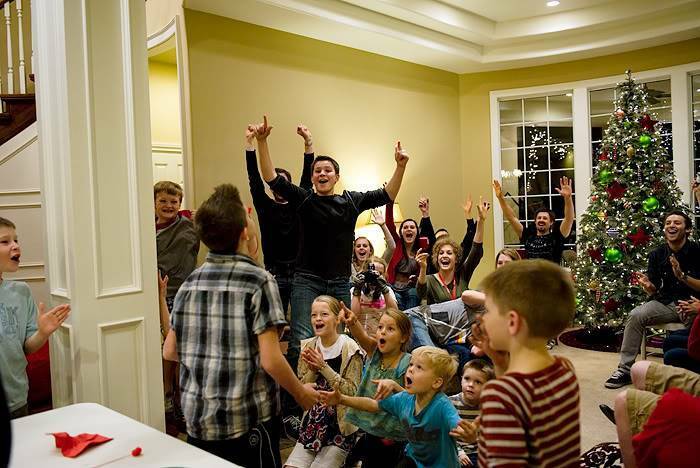 Instead of trying to keep them awake and dealing with cranky kids, plan your party so that it has two countdowns: one for the adults and one for families with younger children. Taking this step will allow everyone to experience the excitement of ringing in the new year, and will avoid having tired and cranky children at your party. Whether you are young or old, a glow party is always a fun affair. Make your New Year’s Eve party an event to remember, with an evening bathed in the luminescent glow of glowsticks and decorations. 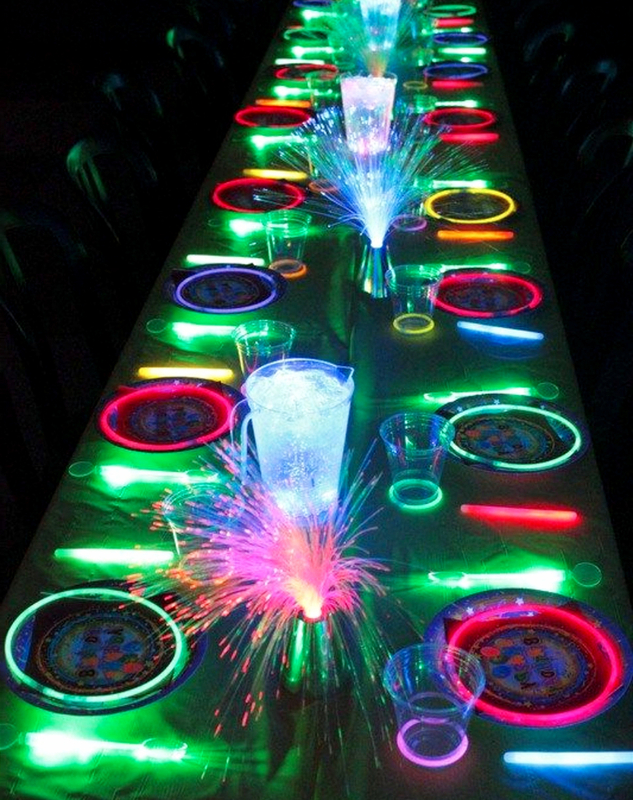 Put glowsticks in balloons before hanging them from the ceiling, and light up the table with plates that are lined with glow sticks. Provide all of your guests with glowing attire like glasses, necklaces, and wands, and encourage them to wear black, so the glowing stands out. Hosting a glow party will make the night feel special, both for the younger kids, and those who are young at heart. New Year’s Eve can be a night that is fun for family and friends of all ages. Planning your party for both children and adults is simple if you make the food kid-friendly, plan fun games, and provide family friendly activities that everyone can enjoy! For more ideas on how to host an epic New Year’s Eve party for children and adults, visit the Falconcrest Homes Blog.